2015 Score Draft Football is a small promo set that has the first Panini-produced cards of several top picks from the 2015 NFL Draft. Key players on the checklist include Heisman winners Jameis Winston and Marcus Mariota, who were the first two picks taken. There are a total of nine cards in 2015 Score Draft Football. Six are available in packs handed out at the Draft Town event in Chicago. This was a lead up to the draft itself. Each of these packs has two cards. The final three cards were available only to attendees at the actual draft and are a little tougher to find. Winston has two different cards. 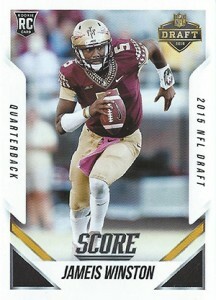 DPJW, the more common card found in Draft Town packs, shows the quarterback in his home jersey. 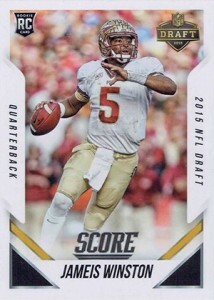 The rarer Draft card pictures Winston in a white FSU jersey. Due to the limited availability of 2015 Score Draft Football, the cards could prove to be somewhat tough to find down the road. In all likelihood, a lot of the cards were given to attendees who aren't big collectors as well. This could result in them being tossed aside or even forgotten about. 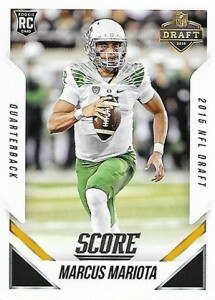 These cards are different from the ones included in the main 2015 Score Football release. DP1, DPDF and DPLW available only at the televised draft. All others inserted in packs given out at Draft Town festivities. 2015 PANINI SCORE NFL Draft TOWN CHICAGO TODD GURLEY Rookie RC #DP6 RAMS ROY? Marcus Mariota 2015 NFL Draft Exclusive Score Rookie RC Oregon Ducks BGS 9.5 x4!